Join our automatic program to receive all 7 parts! 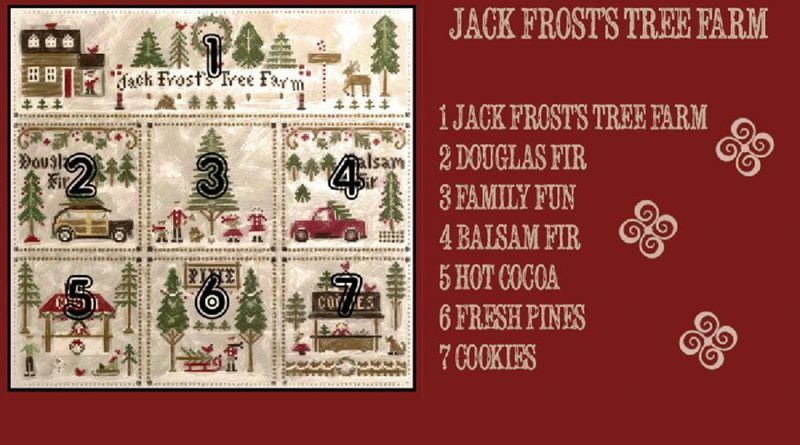 Coming soon to Cross My Heart—Little House Needleworks Jack Frost’s Tree Farm! For this delightful new series, you may choose to stitch on the recommended linen or aida, all as one big piece or separately. You can also choose to bypass the recommended fabric and choose one of your own! The model is stitched with Classic Colorworks and we will have a fiber pack available for you, as well. Part 1 is a larger chart (183 X 58) and is $ 9.50. Parts 2-7 are 58×58 and will be $ 6.50 each. The recommended linen is 30 count Portobello; we have selected a comparable 14 count Aida for those who prefer it. To stitch the whole piece as one, the linen is $13 and the Aida is $14.75. Fabric to stitch individually for part 1; linen is $7.20 and Aida is $8.25. Fabric to stitch individually for each piece for parts 2-7; linen is $4 each and Aida is $4.50. The fiber pack is all Classic Colorworks and will be $36.00. You must register your credit card number with us to join the automatic program and you will be charged when each part comes in. We can mail your package or you may come in to pick it up. Shipping will cost roughly $2.50 per shipment for chart only; chart with individual pieces of fabric, $3.50 per shipment. Part 1 may be slightly more if you have elected to receive 1 piece of fabric and fibers. If you do not wish to leave your credit card number with us, we will have a few extra patterns available on a first come, first serve basis—but be aware you may have to wait until we place a second order. We will not hold one for you unless you are a part of this special automatic program.